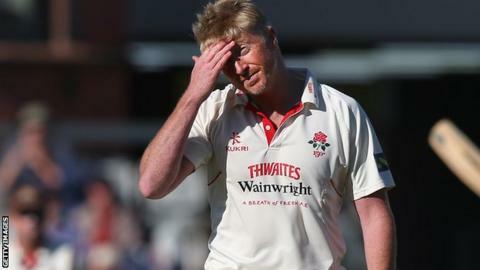 Lancashire captain Glen Chapple does not know in which capacity he will be at the club next season following their Championship relegation. The Red Rose drew their final match of the season against Middlesex to confirm an immediate return to the second tier. Chapple, 40, took control of the first team after Peter Moores left to become England head coach in April. Asked if he will be playing in 2015, Chapple told BBC Radio Lancashire: "I'm not sure, we'll have to see." He continued: "I'm content in the fact that my body is holding up well and I'm enjoying playing. I'm fairly safe in the knowledge that I could play if I wanted to." The veteran seamer has been with the Red Rose for over two decades and captained the county to their first outright Championship title for 77 years in 2011. When asked if he was interested in becoming their full-time head coach, Chapple said: "Who wouldn't be? You can't start denying things like that. "To have the prospect of that role would be fantastic, but at the end of the day the board have got decisions to make and I've got some options either way. "I think the role that I've done this year is not one that is seen to be long-term. Whether that's right or wrong, I'm not sure." Lancashire director of cricket Mike Watkinson says appointing a new head coach is a priority before finalising their preparations ahead of the 2015 season. "Something that is extremely high on the club's agenda is a strategy in appointing a head coach," said Watkinson. "The club will have to look at that as the top priority and, when that's in place, that will help shape our winter preparation, the rest of the squad and how we go forward with our cricket. "Glen's been outstanding to combine his leadership responsibilities with playing this season, but clearly that (playing and coaching together) isn't a solution that we'll go forward with."